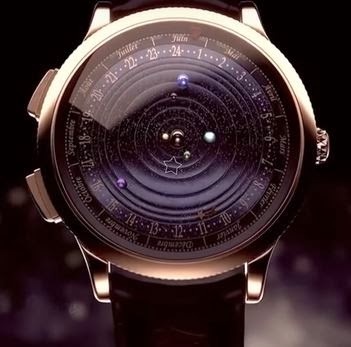 If you want to always be aware of where the planets are, you can now wear them on your wrist with this new astronomical / astrological watch. Designed by Van Cleef & Arpels, the new Complication Poétique Midnight Planétarium watch shows numerical time as well as the rotation of the planets Mercury, Venus, Earth, Mars, Jupiter and Saturn rotating around the central sphere of the Sun in real time. Isn't this what so many of us have wanted for a long time? Over the period of 88 days you can watch Mercury rotate around the central Sun, while Venus will take about 224 days. Saturn, a slow mover because of it's distance from the sun, will take about 29 years to go around the dial. Hopefully the battery lasts that long. Each planet is represented by a semi-precious stone. 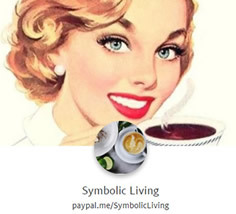 The Sun is pink gold, Mercury is serpentine, Venus is chloromelanite, Earth is turquoise, Mars is red jasper, Jupiter is blue agate and Saturn is sugilite. There is also a shooting star which travels around the sphere daily marking the 24 hours of each day. On the third sphere from the central Sun, where the Earth rotates, a star can be set to a special day. When that day arrives, the earth will be aligned with the star. The outer rim consists of the months. It would also be nice to see a version with the 12 zodiac signs as well. How much does this new addition to the Poetic Astronomy series cost? Well, it's probably out of most people's price range. 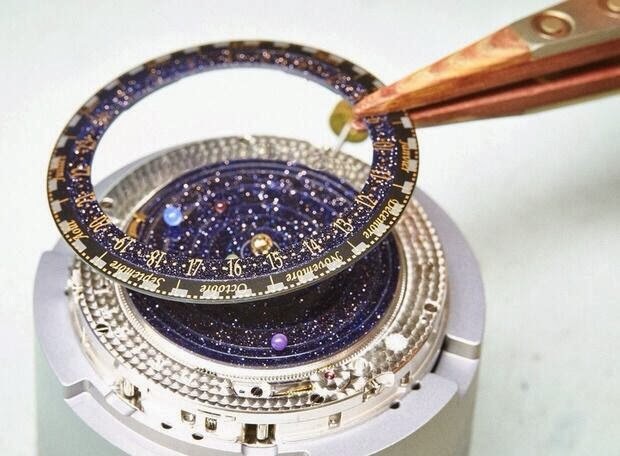 To wear this solar system on your wrist it will set you back just $245,000.